Hands removing alginate facial mask. Work of cosmetician, skin therapy. 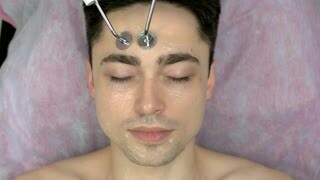 Face of man, microcurrent therapy. Cosmetology procedure in the clinic. 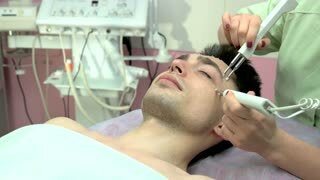 Microcurrent therapy male face. Cosmetologist working with customer. Face of beauty clinic customer. 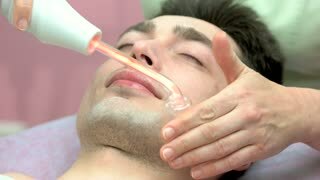 Man having darsonval therapy. Implementing new technologies in medicine.